3. Linea Luxe Faux Fur Cushion in Cream £30.00 [x] : I feel like a fluffy cushion is something we all need in our lives, plus it's faux (because I hate real fur) so what's not to love? 4. Decorative Monkey Figures £2.99 (sale price) [x] : This set of see no evil, speak no evil and hear no evil monkeys are an absolute bargain and a great way to bring a bit of quirkiness to a minimal scheme. 5. Jug In Textured Glass £12.99 [x] : Because it's Summer all I really want to do is make myself iced drinks and sit out in the garden (well when the sun actually shows its face), so a jug like this is perfect for Summer. 6. Marble Photo Frame 4x6 £12.00 [x] : As a self confessed marble addict, it seems only inevitable that I'll end up buying it one day. So chic. ive been looking for a photo frame that looks good as decor for my wedding. Loving the marble! 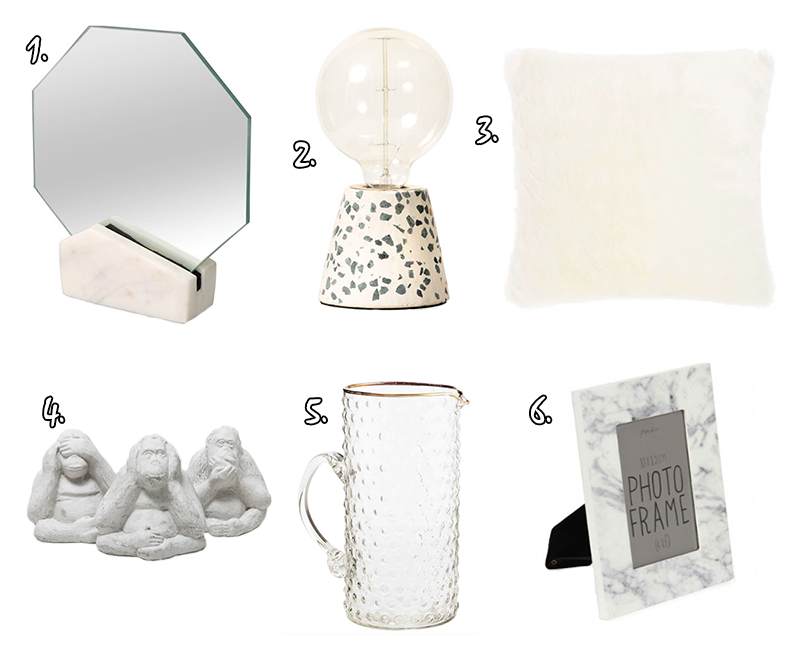 I'm really loving marble and love the photo frame. I also think the monkeys are adorable! I love the monkey figures the most, it has a good message and looks really cool too! You haven't been active, Vicky, hope everything is okay and you're not quitting blogging.